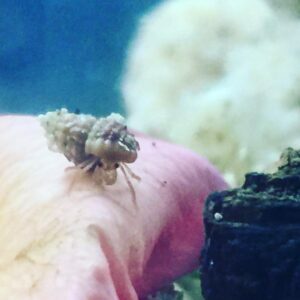 54 day old hermit crab, bred, hatched and raised in captivity by Mary Akers, sitting on a rose petal. We are pleased to announce our first ever hermit crab conference! Anyone with interest in land hermit crabs is invited to attend. This is a chance for hermit crab hobbyists to come together and get to know each other, learn and shop. You do not have to be a member of our organization to attend. Free and open to all! You are not required to be a LHCOS member to adopt but you must meet the minimum standards of care observed by our organization. We are currently booking speakers and vendors for the event. If you are interested in speaking or vending at the event please contact us. Here is a TENTATIVE schedule for the conference. Conference Hotel: Check-in. Early arrivals will have the opportunity (completely optional) to personally select your own crabs on the evening before the conference begins. First come, first pick. After selection, your babies will be placed into your personal, labeled travel tat, which will be reserved for retrieval Sunday morning at the post-conference pick-up. Early selection may occur at the conference hotel if they will grant us a space to do this and conditions permit it. If not, it will happen at my home, but the window to do so will be restricted (strictly) to one hour so that it doesn’t occupy my entire Conference Eve. Time: TBD, but roughly 6pm-ish. Conference Room set-up for sellers. I’m hoping they will let us in Friday night to set up our sales tables. If not, we can do it early Saturday, but my preference would be to just roll in Saturday morning, ready to go. Crab Con Marketplace. Seller tables will be open for sales of crab-related items during regular business hours. Official Opening of the First Annual International Crab Con. Coffee and Donuts served. Announcements and late registration for those who still need to pick up their packets. Free time / marketplace shopping time. Coenobita Species Identification. A slide presentation and talk by Stacy Griffith. Involving Kids in the Proper Care of Hermit Crabs. A talk and slide show by Kaitlyn Peplowski. Building a vertical crabitat. A slideshow tutorial by Stacy Griffith. Establishing a Bioactive Crabitat by Courtney Carr. Marketplace closes. Swap out auditorium seating for banquet seating. Optional Dinner / Social Time in the Conference Room: Coordinate $$ and delivery of local pizza with (authentic) Buffalo wings (or individuals can bring their own take-out items). 9am-Noon: Marketplace sales continue—as desired by sellers and attendees. 9am-Noon: Adopters pick up their travel tats and baby crabs and make any follow-up payments for additional available crab babies (as needed). Seeking sponsors: For a donation of cash or product your logo will be printed on the canvas gift bag going home with all adopters. Please use the form below to contact us about sponsorship. 1) Yes, there is an adoption fee. My goal has always been to see hermit crabs valued as exotic, long-lived pets. And if I–who painstakingly raised them from birth–can’t value these special little creatures in that way, then who will? It feels like it’s up to me, from Day One, to expect the world to place a value on captive-bred hermits. All adoption fees will go toward funding future breeding attempts. 2) Yes, you can *request* a species as we get closer to the date, but I absolutely cannot guarantee I will be able to honor anyone’s special species requests. There are still too many unknowns in terms of survival and species count. Also, it is my firm conviction that ALL of these babies are special, no matter their species. 3) If adopters want to swap with each other to get the species/crab they most want, I have no problems with that. 5) Additional babies will *likely* be available at the end of the adoption weekend. If so, approved adopters may get more than two, as desired. I just can’t predict how many I will have until much closer to the date, so I’m being conservative now. 6) I can keep the babies at my home until Sunday morning if people don’t want to keep them in their air-conditioned hotel rooms. That way you can pick up on your way out of town. 7) I will provide a sheet to each adopter with dates and information slots for the quarterly growth and behavior check-ins. 8) The first 50 (fifty) approved adoption applications will be guaranteed (as much as one can–barring any tragic, unforeseen losses). All applications after #50 will be added to a waiting list and filled in the order they were approved as the number of available crabs becomes more concrete.